"There was an electric heater, a typewriter, a bunk for Napoleonic naps and a telephone to the house which could be used for emergencies such as lunch: surely everything a writer could need." There are many outbuildings at Monticello, the house and gardens near Charlottesville, Virginia, owned and designed by President Thomas Jefferson, but the vegetable garden pavilion is arguably the most pleasant. It has double-sash windows, an attractive railing and a pyramid roof and was used by Jefferson as a quiet retreat where he could read in the evening. Destroyed in the early 19th century, it was rebuilt in 1984 using Jefferson's own notes. "Sinister, witty, fantastic, romantic, surreal, all of these words can be applied to the garden pictures of François Houtin. These are strange and haunting horticultural visions, their hallucinatory character heightened by the artist's use of monochrome. 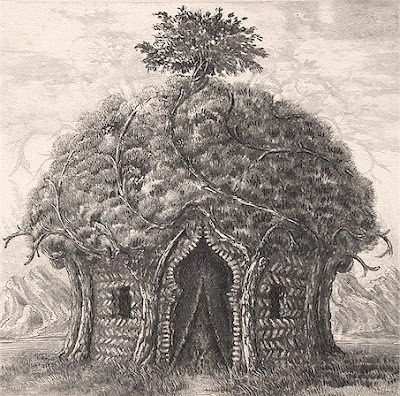 Houtin is above all a superb technician, never more so than in the subtle cadences of his etchings. Here is an eye and a mind from which allusions seem to tumble from Arcimboldo to Dali, from Desiderio Monzu to Le Doux, from Hieronymus Bosch to Schinkel. 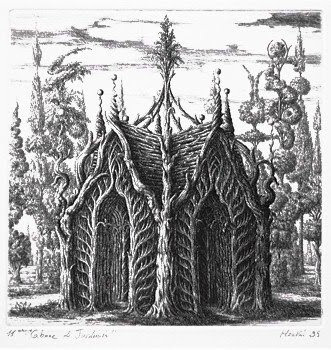 Here too are echoes of things seen in the great garden design and festival books of the past, extravagant pavilions, bizarre fountains and a world in which nature is subjected to almost savage contortions." 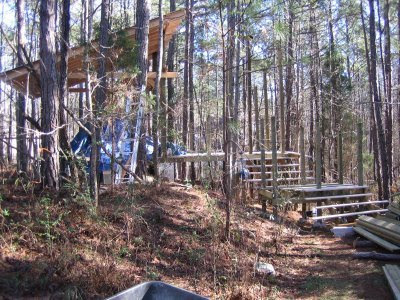 "there simply is no exact English translation for the French cabane. "Cabin" has a different connotation in English. "Garden shed"--with its overtones of dusty storage--just doesn't do justice to the esprit of the French cabane, which is part get-away, part nature-hideout, part playhouse--but especially a place with a sense of secrecy and even magic, a place to fantasize and dream." 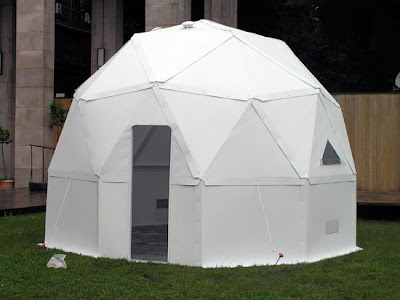 "The exhibit does a good job of leading you to reflect on the roles the garden cabane plays with respect to the human spirit. Rooms are dedicated to "refinding oneself," shelter, the desire to build, the desire to escape, to dream, and to tell a story." 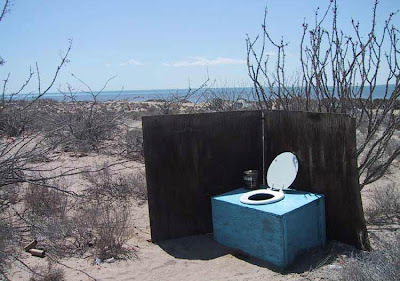 Outhouses of Baja is an excellent collection of photos by John O Burns taken during a 2,000 mile offroad motorcycle trip through Baja, Mexico, ranging from the artistic (above) to the most basic structure (below). 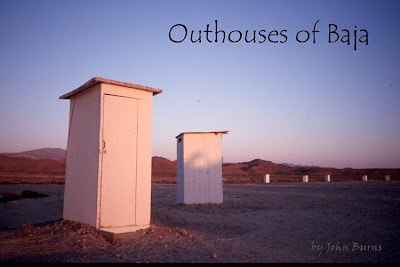 He has also put together a great selection of outhouses in the Western United States. One of the keys to a successful shedworking setup is the ability to have a siesta to recharge your batteries. The Nappak means you don't need to settle uncomfortably into your work chair nor nip back into the house. 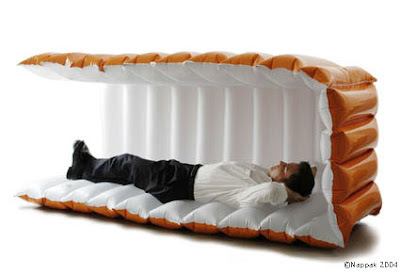 Merely inflate and lie down. It rolls into a small tube for easy storage. • Full wiring loom incorporating heating, power, lighting and communications. Options include real slate or clay tile roof, painted or waney edge exterior cladding, decked verandah, vaulted ceilings, Velux windows, lead finials, and hardwood flooring. 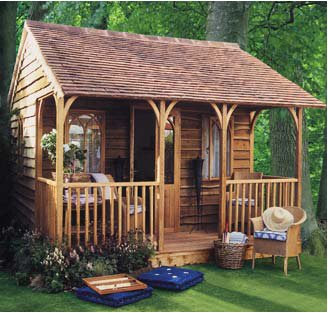 Their sister company is Sanctuary Summerhouses which have a wide range of other shedlike structures which would be suitable for less allround shedworking but are equally as attractive. As reported in various places (including Personnel Today), a whopping seven out of every 10 employers admit they 'never or occasionally' accept requests to work from home. The new Labour Market Outlook survey of 735 UK employers was released by the Chartered Institute of Personnel and Development and Gerwyn Davies, policy adviser at the CIPD, said: "Inflexible approaches to homeworking risk restricting the competitiveness and growth of UK organisations if employer and managerial mindsets do not change." Of those employers in the survey offering homeworking, just 8% felt homeworkers were less productive than colleagues in traditional offices, just under a third said they were more productive, and just under two-thirds that there was no difference. "There is an entrance each end. The forward, or main cabin, is fitted with a coal burning yacht's range, sink, and ice box one side; comfortable upholstered seat, drop leaf table, shelves and lockers the other side. There will be an additional shelf over the sink and ample room under the forward deck for stowage as well as room for a good sized water tank. 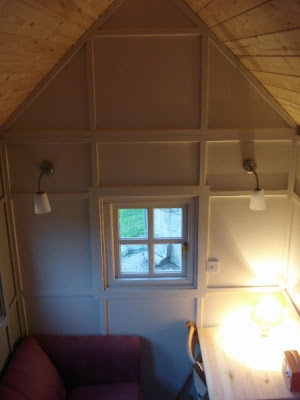 The sleeping cabin is fitted with single berth; chest of drawers; lockers; hanging locker; and W. C. located beneath the seat which forms a step at the after entrance." 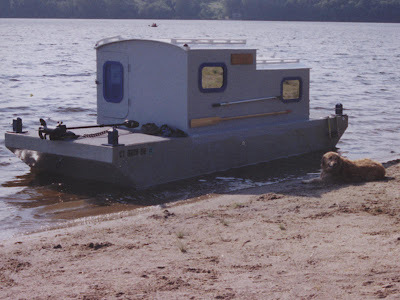 There are lots more simple but attemptable small boat designs to browse around on the site. Robin Hamman, blogmeister at the BBC (among much else) runs an excellent blog about Shedworking's home town of St Albans. 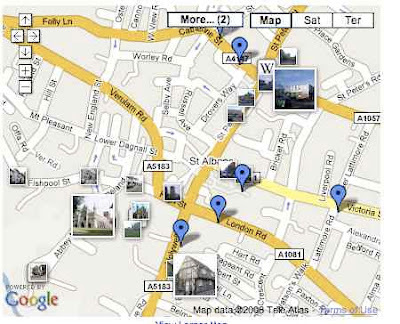 He has also put together an excellent list of free wi-fi spots in the city. I know there are various sites which also provide this type of list, but they always seem to be a bit hit and miss. If you know of similar ventures to Robin's (i.e. properly detailed free wi-fi spots) around the country, please let me know and we'll start up a list. 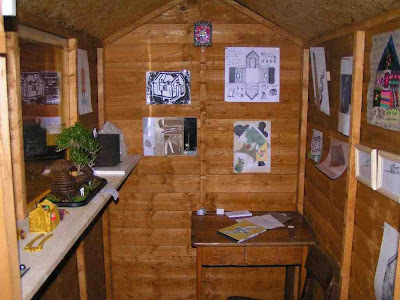 Another item for the Sheds As Art folder, the three Shedshows which were held in 2005 and 2006 at various UK venues asked artists, photographers, designers, modelmakers and illustrators to design their ideal shed and/or fill it with artwork. Initially inspired by William Morris’s novel News from Nowhere, the three shows (click here for 1, here for 2, and here for 3), grew increasingly large and the final show featured sheds by staff and students from the Visual Communication Department at Birmingham Institute of Art and Design and included drawings, models, tightly scribbled plans, cages and collections of bottled memorabilia. Well worth a long browse. 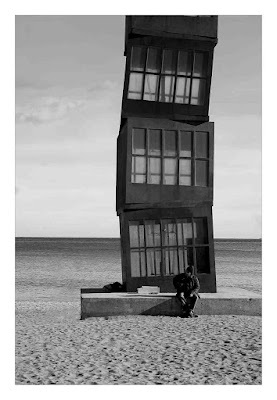 "This is a kind of 'memorial' to the beach huts that used to occupy spaces along the length of the beach in Barcelona, Spain. I don't know the whole story but basically they were done away with and this monument marks as some sort of respect to what was once there. I never seen it at night, but from what I can see it can light up. Must look great." 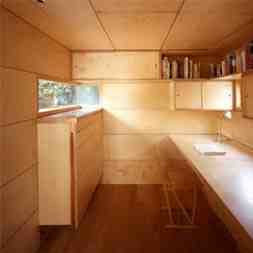 We've been following Laura Geary's shed on wheels project from her initial thoughts through to the finished product. Here are the final pictures showing the interior of the marvellous build. Business Week is on the lookout for photos of interesting home-based businesses. Mildly insultingly they say they want to hear from members of the "pajama workforce" and are asking them to send in a brief description of their workspace along with one digital image. They will "feature a selection of outstanding work spaces in an upcoming special report in photo-essay format and ask readers to vote on their favorites". 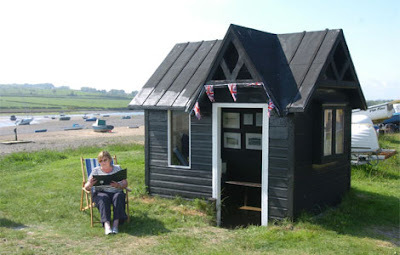 As reported in the Journal by Tony Henderson, Judi Hill's 100-year-old former ferryman's hut is probably the smallest heritage centre in the North East of England. 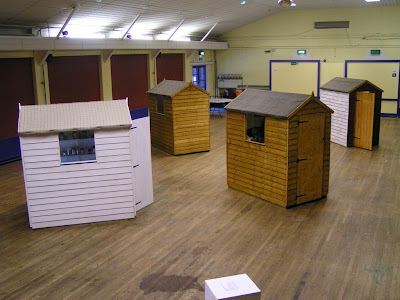 The 9ft x 7ft hut, used as storage for the last few decades, has been given a wash and brush up and turned into a titchy museum celebrating the life of local historic ferrymen and fishermen. 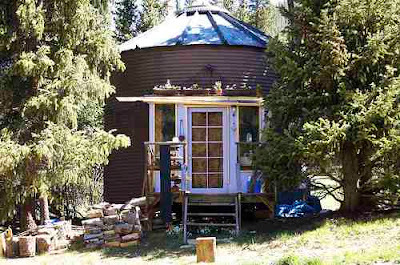 “I am a bit of a hut person," she told Henderson. "It isn’t just about men and their huts, there are also women and their huts." "Stern is a busy man leading three professional lives—architect, historian and dean of Yale’s architecture school—and in his practice, he found that his time and concentration were being nibbled away as associates approached him in his office asking him for “just a minute.” Stern needed a quiet place for working with two writing colleagues as well as a getaway of his own....“I wanted to create a magic relationship between inside and outside, with gigantic doors that folded open to an outside deck on the same level,” he says." I particularly like this final quote from the piece from Stern. The article is well worth a browse. "He wrote in the shed as long as I knew him - we worked together for 15 years from 1975 to 1990 and I illustrated a dozen of his books. 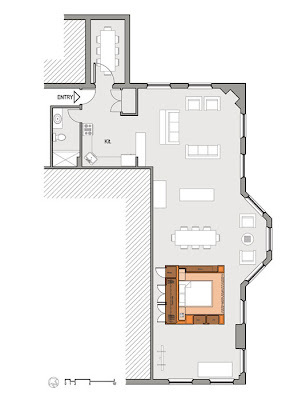 I would take my drawings down to Gipsy House for him to look at while sitting on the sofa in the dining room. I don't think he let anybody in the shed." I recently visited the Roald Dahl Museum in Great Missenden with Mrs Shedworking and the three little Shedworkings. Not only is it a marvellous place for children, it has a recreation of Dahl's study, complete with slightly battered chair which you can sit in. 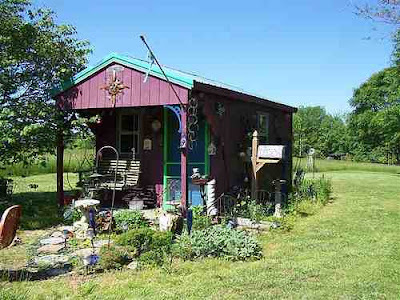 The actual shed is at Gipsy House, a little further down the road. 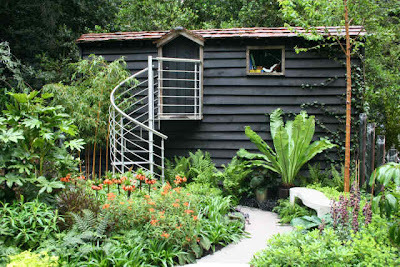 Gipsy House is only open a few times a year usually as part of the National Gardens Scheme charity. 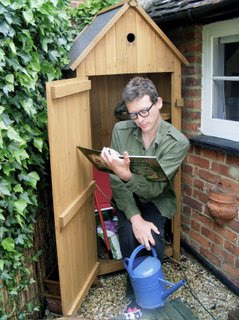 The next dates are 11 June and 17 July (2-5pm), and as well as the writing shed there is a small wild garden where you can see Danny The Champion of the World's caravan under a tree house. 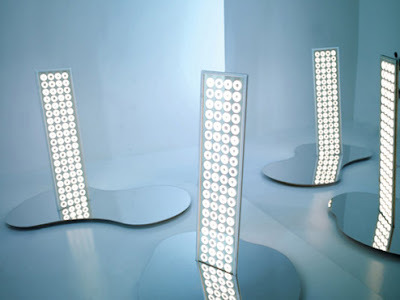 If you loved the light-emitting wallpaper, imagine the possibilities of this light-emitting glass from Saazs, especially considering how much window space is built into the normal garden office. At the moment it's only being used in tables and shelves, but they're working on something a bit bigger. The race is on to win the coveted Shed of the Year title which will be held this summer as part of the second National Shed Week. 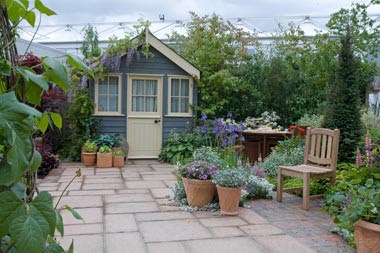 Organised by the internationally famous readersheds.co.uk, National Shed Week (which runs from July 7 until July 13 2008) will celebrate one of the cornerstones of British culture, the not so humble Garden Shed. 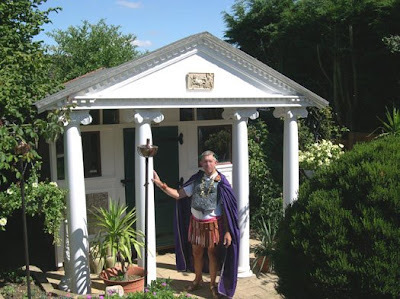 Can this year's sheddies beat the wonderful and unique sheds that we showcased in the inaugural Shed Week last year, including the amazing Shed of the Year 2007 which was a Roman Temple built by Tony Rogers? (pictured above). This year's judges are property guru Sarah Beeny, wind-up radio inventor Trevor Baylis, Professor of beach huts Kathryn Ferry, Treehugger's eco-architect Lloyd Alter, Uncle Wilco from readersheds.co.uk/Shedblog, and me. Sheddies still have time to "Share their Sheds" at the readersheds.co.uk site and can enter their buildings on the website ready for the judging in late June. 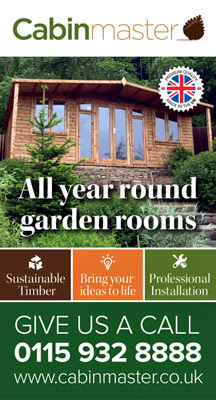 This year we are very pleased to announce that one of the UK's leading online garden building companies, Garden Buildings Direct will be the official sponsor and shed partner for this year's Shed Week and will be providing the prize for the Shed of the Year Competition. 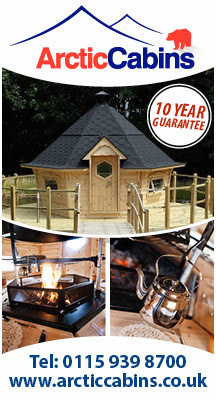 The grand prize will total £500 and the winner will be able to choose products from Garden Buildings Direct or products from one of their sister websites selling extensive ranges of garden furniture, outdoor toys, fitness equipment and BBQ's. 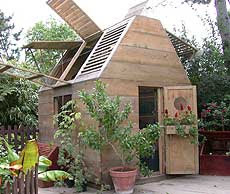 This is the second year we have run the competition which pits wooden sheds against TARDISes, and garden offices against beach huts in a battle royal to win the title of Shed of the Year 2008. 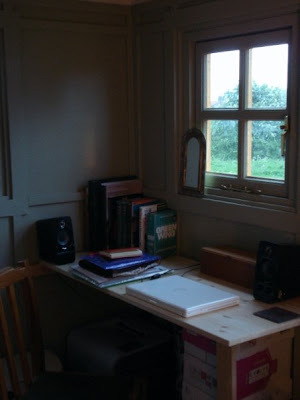 Sarah Wigglesworth has featured on Shedworking before, but here's another helping of her fine work, the G-Box. 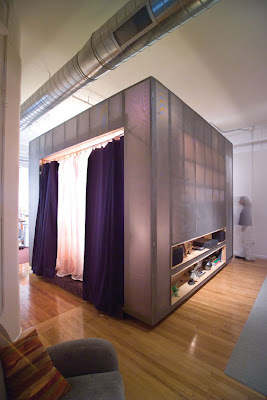 She defines it as a modular building system for small self-contained structures. 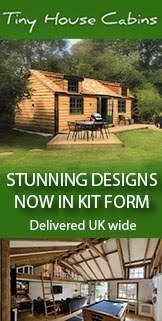 It's fully insulated, pre-wired clad in plywood and designed for all year shedworking, coming as a flat-pack or ready-to-go structure which is craned in. A G-Box website is promised. Thanks to the eagle-eyed Bill Kratz. As I mentioned yesterday, there's more to National Shed Week than the prestigious Shed of the Year competition - there's also a photo competition. And here's another great example, by Rachel and Hugh, of how they shed up in Oman. It's simple to enter the competition - all you need to do is upload your shed or shed-related photo to the Shed Week 2008 pool and you could be a winner. 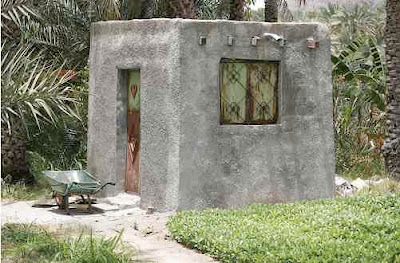 Two examples of solar-powered composting outhouses today. First, a privy on the Mt. Whitney Trail which was removed in spring 2007 (photo by Jeff Brewer). And another in the White Mountains of New Hampshire (photo by David Metsky). 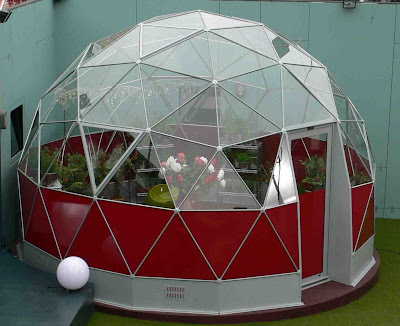 "The intention was to create a garden for a solicitor whose firm is looking for innovative ways to encourage flexible working. 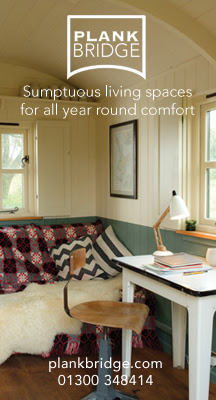 As a result the client works from home a few days a week in an office which has been built in a barn at the bottom of his garden. Access to the office will be via a sweeping path leading to a stainless steel curving staircase in the corner of the garden. The concept is to design a garden in the area around the staircase which leads up to the barn to create a dramatic and exciting ‘journey to work’." Thanks to The Garden Monkey for the alert. I'll be posting more about this year's National Shed Week on Friday so do drop by for that, but in the meantime don't forget that as well as the Shed of the Year competition, there's also a photo competition. 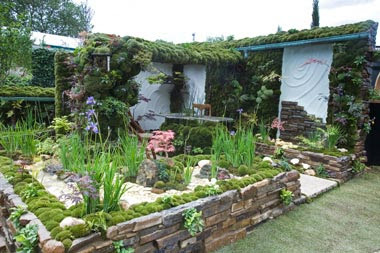 And here's a lovely example, self-taught "mosaiker"StJohnsGypsy's Retreat, the kind of shedlike structure that brings out plenty of oohs and aahs. It's simple to enter the competition - all you need to do is upload your shed or shed-related photo to the Shed Week 2008 pool and you could be a winner. The Work Wise UK Summit took place today at the QEII Conference Centre in London with speeches from the Rt Hon. Hilary Benn, Secretary of State for Environment, Food and Rural Affairs, plus Brendan Barber, general secretary of the TUC and Edmund King, president of the Automobile Association. The theme was the environmental impacts of work and how the wider adoption of smarter working practices could make a major contribution to solving the environmental catastrophe predicted by many. Dr Richard Betts, head of climate impacts at the Met Office Hadley Centre, said: "The world is definitely getting warmer, and it is very likely that this is due to our ever-increasing emissions of greenhouse gases. To slow down climate change, we will need to reduce our emissions - smarter working could make an important contribution to this." “Real progress has been made in persuading more employers to offer innovative flexible working practices. Those employers that take the plunge report back benefits to their business, including improved productivity, reduced costs, and better staff recruitment, retention and motivation. What a shame then that all we ever seem to hear from the business lobby is continued negativity towards flexible working. Last week’s all-so-predictable bleating around extending the right to request was a case in point. 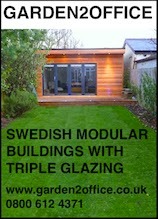 Check out Solardome.co.uk for full spec. Currently being used in new Channel 4 programme shooting near Longcross, Surrey. Will be available to dismantle / collect from 7th June 2008. 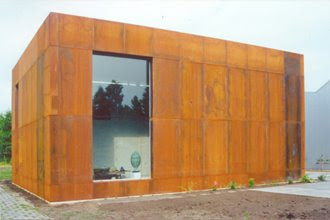 Red adhesive material easily removable from lower panes. 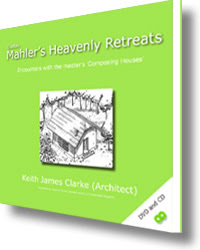 Encounters with the master's Composing Houses. This pre-concert talk will consider the building, its surroundings and associations where Mahler created his 8th Symphony in E flat major. This work will be performed later in the evening at St Paul's Cathedral. No reservations required for the lecture, but tickets for the concert are available from the City of London Festival. "You can take the analysis even further. Get people to teleconference and you have an impact on airplane emissions, and enough people working virtually means fewer buildings to power, heat and cool. But you don't even have to go that far. Teleworking even one day every two weeks should theoretically cut gas usage by 10 percent, which is hardly marginal." The Ark is abstract artist Lucas Kuys' floating beach hut (put on the market last month for £60,000) at Burnham Overy Staithe, near King's Lynn, Norfolk. 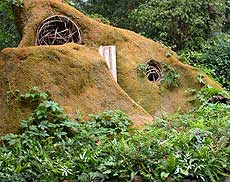 It's 16ft 5in x by 6ft (1.8m) and built on a raft using driftwood, reclaimed wood and the roof of a grocery van. It's been in situ, anchored so that it doesn't float away, for around 50 years since it was built by a local doctor.Via The Daily Mail and the Daily Telegraph where there is lots more detail. 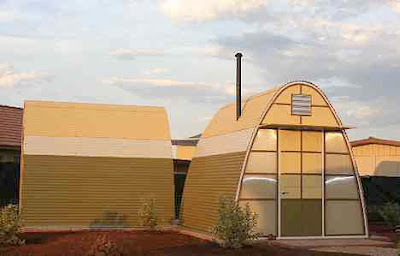 cdmb architects have a nice line in shedworking structures. 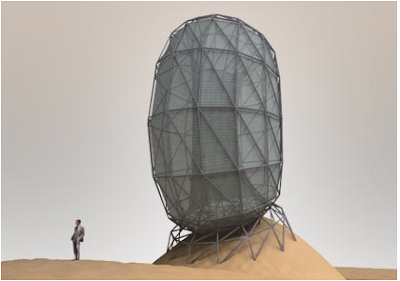 Above is the Desert House, a lightweight structure (or as they call it 'a modern nomadic house') designed to protect the desertloving shedworker from the strong sunlight and sand storms of the Gobi Desert. 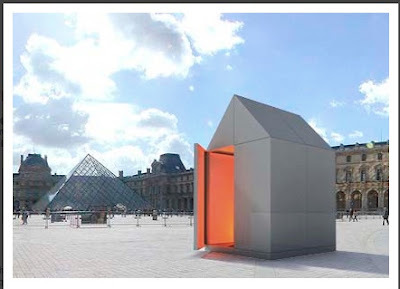 Below is a more traditional example, The Rook, a stainless steel shed of three modular components made to be easily assembled and transported, pictured here outside the Louvre. A Bill Kratz spot. 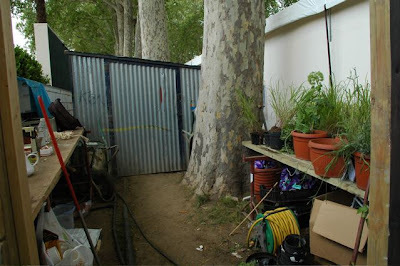 "Whilst they were enjoying the sunshine, I snuck a look inside one of the famous "Chelsea Sheds" [above], the backstage areas for all the amazing show gardens. Indicatively, despite the fact that it is the "messy backstage", it is tidier than any real shed of my acquaintance." 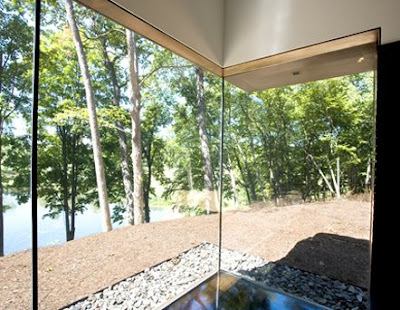 This writer's studio in Ghent, New York, by Wendy Evans Joseph Architecture is in the woods, 200ft away from the main house. 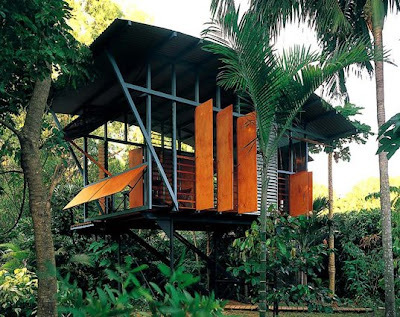 It's rather plusher than the average garden office, 600 square feet, high ceilings, glass cornered walls and smashing views onto the woods and nearby pond. Made from wenge, cedar, cleft-face slate and natural plaster. 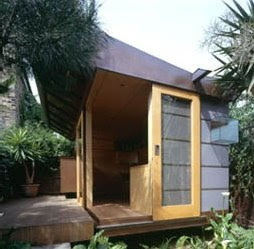 The Love Shack, from Australian Smartshax, is a fine example of how shedworking should be adapted to local conditions. 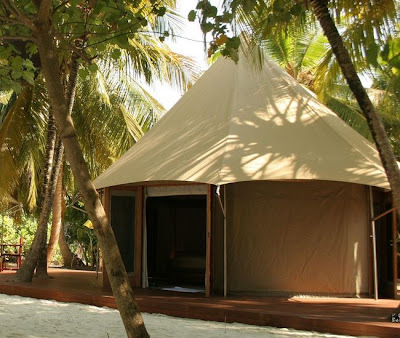 Their goal is to provide environmentally-friendly wooden huts with large sliding doors and shuttered openings instead of windows to bring you closer to nature - indeed their slogan is "Basic amenity plus maximum connection to where you are". 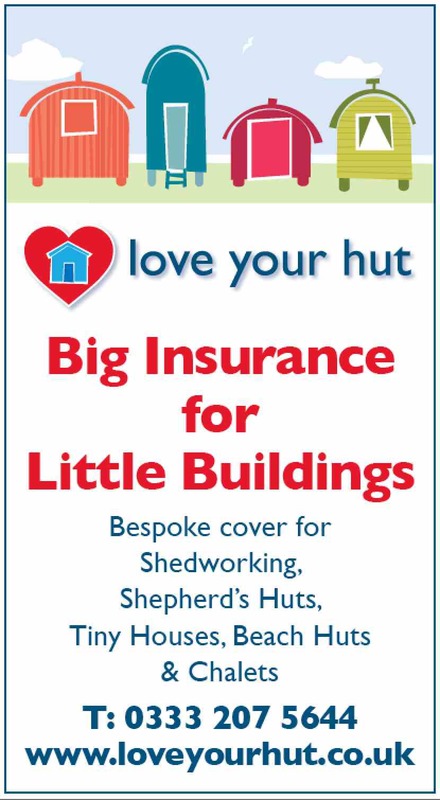 Just a quick word to say the shepherd's hut advertised for sale earlier this year on Shedworking has been sold. 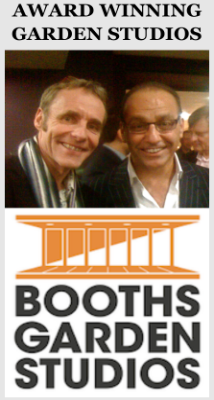 If anybody else has a shedlike atmosphere they'd like to sell through Shedworking, please do get in touch. “In a world increasingly driven by the internet and mobile communications, the requirement to travel to and from work at the same time to the same place every weekday is going to look more and more old-fashioned. This, and travelling many miles to attend meetings, will be increasingly unnecessary considering the technology available, and the nature of the global market. A change to working practices, and hence travel patterns, is one of the solutions to road congestion and public transport overcrowding, and probably the only one that is achievable in the short term." In short, we should all be shedworking. Beach Hut Tuesday - end of the bubble? 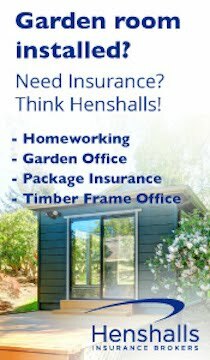 Can shedworking improve your health?